Harness the Power of Foods to Boost Your Mental Health! 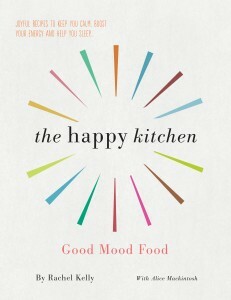 Alice has teamed up with established author, client and friend Rachel Kelly to create The Happy Kitchen – released January 2017. Order here! Since her last serious bout of depression in 2011, Rachel Kelly has evolved a broad holistic approach to staying well, but at the heart of her recovery has been changing the way she eats. 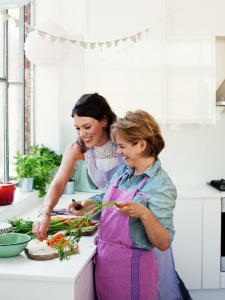 Over the past five years, Alice has worked with Rachel to build up a repertoire of recipes that target particular symptoms, from insomnia and mood swings to stress and exhaustion. The result is a cookbook which offers something different: a wonderfully calming and pleasurable read, with delicious recipes and meal planners, as well as sections that cover the Golden Rules for a Happy Kitchen and Super Good Mood Foods. In “Nutrition Notes” scattered throughout the text, Alice explains the latest science on particular foods and their role in boosting our mental health. It was really important to the duo that everything is backed up with evidence, and you can see that evidence listed here. Follow Rachel and Alice’s advice, and without trying, you too will, week by week, become more energised, less anxious and cheerier. See the video below to learn more about The Happy Kitchen, our story and what the book is all about.